Looks amazing! Love a good eclair! Very useful information, a wonderful blog and recipe..I will try this one of these days.. Thanks trissalicious..
It’s been too long since my last visit to your blog, Trissa, and I return to a post on salted caramel eclairs! 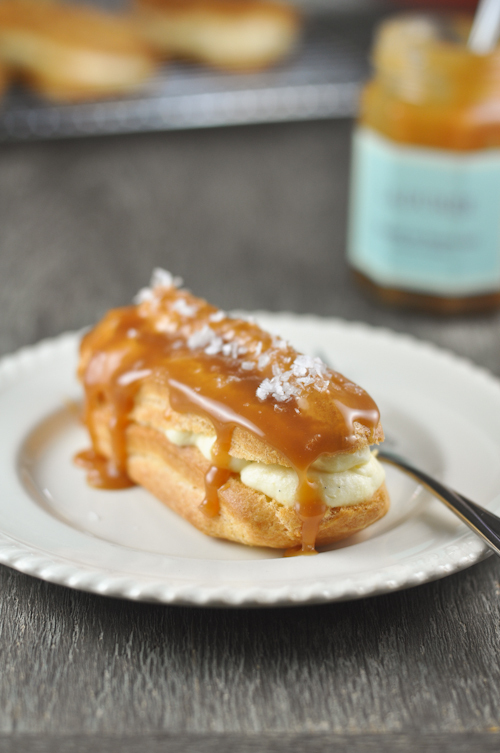 What timing… I adore salted caramel. Looks heavenly!!! Wow! This looks very delicious. I love any foods that have caramel toppings on it. Thanks for sharing the recipe here! that’s the most delicious looking éclair! Wow your eclair looks amazing! Love the salt flakes on top too! Something different and a perfect Fall pastry. Thanks!